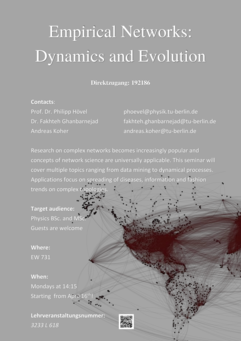 The seminar offers perspectives on our current research in the area of Complex Systems and Networks. The seminar is particularly suitable for BSc and MSc students looking for a final project. Students, who want to obtain a "Seminarschein", are welcome as well. Research on complex systems becomes increasingly popular, concepts of network science are universally applicable, and the amount of generated and avalaible data is ever growing. This seminar will cover multiple topics ranging from data mining to dynamical processes. Applications focus on spreading of diseases, neuroscience, information and fashion trends on complex topologies. 1) Modelling terrestrial route networks to understand inter-polity interactions. Topics marked by * are suitable for student presentations ("Seminarschein"). Please contact the respective advisor in case of interest in a particular topic. The assignment will be done during the first seminar on April 16, 2018. [BEN16] Bentley, Barry, Branicky, Robyn, Barnes, Christopher L., Chew, Yee Lian, Yemini, Eviatar, Bullmore, E. T., Vétes, Petra E. and Schafer, William R., The Multilayer Connectome of Caenorhabditis elegans, PLOS Comp. Bio. 12, 1 (2016). [CIM15] Cimini, G., Squartini, T., Garlaschelli, D. and Gabrielli, A., Systemic Risk Analysis on Reconstructed Economic and Financial Networks, Sci. Rep. 5, 15758 (2015). [GEM14a] Gemmetto, Valerio, Barrat, A. and Cattuto, C. , Mitigation of infectious disease at school: targeted class closure vs school closure, BMC infectious diseases 14, 695 (2014). [HAU14a] Hausmann, Ricardo, Hidalgo, C. A. and others, , The Atlas of Economic Complexity: Mapping Paths to Prosperity, MIT Press Books 1, (2014). [HID09] Hidalgo, C. A. and Hausmann, Ricardo, The building blocks of economic complexity, Proc. Natl. Acad. Sci. U.S.A. 106, 10570 (2009). [HID07a] Hidalgo, C. A. , Klinger, B. , Barabási, A-L and Hausmann, Ricardo, The Product Space Conditions the Development of Nations, Science 317, 482, (2007). [HIZ16] Hizanidis, J. , Kouvaris, N. E., Zamora-López, G. , Díaz-Guilera, A. and Antonopoulos, Ch. , Chimera-like states in modular neural networks, Sci. Rep. 6, 19845 (2016). [IAC18] Iacopini, Iacopo, Milojević, Staša and Latora, V, Network Dynamics of Innovation Processes, Phys. Rev. Lett. 120, 048301 (2018). [KAL10] Kaluza, P., Kölzsch, A., Gastner, M. T. and Blasius, Bernd, The complex network of global cargo ship movements, J. Royal Soc. Interface 7, 1093 (2010). [LAZ18] Lazer, David M. J., Baum, Matthew A., Benkler, Yochai, Berinsky, Adam J., Greenhill, Kelly M., Menczer, Filippo, Metzger, Miriam J., Nyhan, Brendan, Pennycook, Gordon, Rothschild, David, Schudson, Michael, Sloman, Steven A., Sunstein, Cass R., Thorson, Emily A., Watts, Duncan J. and Zittrain, Jonathan L., The science of fake news, Science 359, 1094 (2018). [MAS15] Mastrandrea, Rossana, Fournet, Julie and Barrat, A. , Contact patterns in a high school: a comparison between data collected using wearable sensors, contact diaries and friendship surveys, PLoS ONE 10, e0136497 (2015). [MON17] Mønsted, B., Sapiezynski, P., Ferrara, Emilio and Lehmann, S., Evidence of Complex Contagion of Information in Social Media: An Experiment Using Twitter Bots, arXiv preprint arXiv:1703.06027 (2017). [PEI12a] Peixoto, T. P. and Bornholdt, S., Evolution of robust network topologies: Emergence of central backbones, Phys. Rev. Lett. 109, 118703 (2012). [PEI17b] Peixoto, T. P., Nonparametric Bayesian inference of the microcanonical stochastic block model, Phys. Rev. E 95, 012317 (2017). [SEK16] Sekara, Vedran, Stopczynski, Arkadiusz and Lehmann, S. , Fundamental structures of dynamic social networks, Proc. Natl. Acad. Sci. USA 113, 9977 (2016). [STE11c] Stehlé, J. , Voirin, N. , Barrat, A. , Cattuto, C. , Isella, L. , Pinton, J. F. , Quaggiotto, Marco, Van den Broeck, W. , Régis, C. , Lina, Bruno and others, , High-resolution measurements of face-to-face contact patterns in a primary school, PLoS ONE 6, e23176 (2011). [THU17] Thulke, H.-H., Lange, M., Tratalos, J. A., Clegg, T. A., McGrath, G, O'Grady, L., O'Sullivan, P., Doherty, M. L., Graham, DA and More, SJ, Eradicating BVD, reviewing Irish programme data and model predictions to support prospective decision making, Prev. Vet. Med. 150, 151 (2017). [VAR11] Varshney, Lav R, Chen, Beth L, Paniagua, Eric, Hall, David H and Chklovskii, Dmitri B., Structural properties of the Caenorhabditis elegans neuronal network, PLoS Comp. Biol. 7, e1001066 (2011). [VOS18] Vosoughi, Soroush, Roy, Deb and Aral, Sinan, The spread of true and false news online, Science 359, 1146 (2018).